Remember the possible gaming revolution that will or could be OnLive? We recently connected some dots and asked Microsoft if they could be a part of it. We received an answer and a compliment. Despite what appears to be a converging of technological capabilities, Microsoft has told Kotaku that it's too early to talk about whether the Xbox 360 could be capable of replicating the promised capabilities of the OnLive service. Those abilities would have freed Xbox gaming from requiring discs, downloads or possibly even an Xbox itself. To explain why we asked such a question, it helps to remember what OnLive is. Announced in March and proven to work in controlled press demos (one of which I experienced, hands-on), OnLive would alter the way games are bought and owned, if not how players would control them. The crux of the service is a shift that moves the computations that typically occur in PCs or game consoles when a game runs to a server farm located far away from any OnLive gamer. The OnLive gamer would play games as they normally would, using a traditional-style controller. They would see their game play on the screen of their broadband-connected PC or TV, the latter of which would need to be plugged into a "microconsole" that's a little larger than a DS. The secret sauce of OnLive would be the ability for it to send the video signal of the game from that server farm to the player's screen with no delay in sync with any button presses by the gamer. 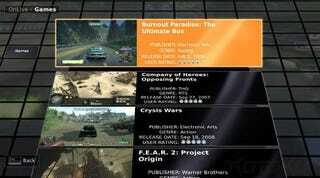 As seen in the press demos, games such as Crysis and Burnout Paradise could run smoothly through OnLive. In theory, any game could. Gamers would be able to buy, rent or even spectate new games with no delay. And then, during this month, June, Microsoft announced at E3 that the Xbox 360 would support a technology called Instant Streaming In 1080p. When demoed, it presented no-delay, no-disc, no-download high-quality feature-length video, something any user with a fat enough Internet connection would be able to enjoy. During the same E3 show, Microsoft signaled an increased willingness to support disc-free gaming by announcing the August launch of a program to sell full-sized downloadable games digitally to the 360. I thought I saw roads about to converge. With Microsoft showing off this blistering ability to stream high-quality video and a gusto for expanding its involvement in disc-free gaming, I asked John Schappert, Microsoft's corporate vice president of Xbox Live software and services, if these developments put Microsoft on a path to offering OnLive-like functionality via the 360. "I think [that] you connecting the technology dots is astute," Schappert said. "But it's nothing we're ready to announce or talk about today… I think that a broadband-connected console to the television enables us to do many things. And, as the bandwidth continues to increase and latency continues to decrease, I think it opens up new avenues of possibility. And of course I've got 5000 smart people back home that will tell me all the crazy things that can't be done. But there's also just as many that can solve all these technological problems and deliver the amazing innovation that they're doing. I think anything is possible but nothing that we're going to announce right now. I think just delivering 1080p [without delay], something that no other device has done, is pretty amazing." I jokingly suggested Microsoft just buys the service. OnLive… Xbox Live… Xbox OnLive? "I think they liked our name, didn't they?" Schappert laughed.